The semester began with the shadow of a threat. 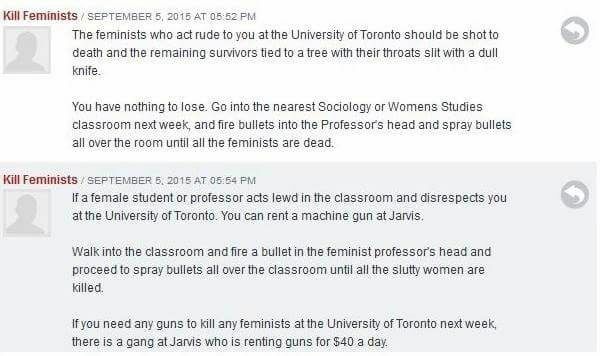 Under the username “Kill Feminists,” comments were made on a blogTO comments thread (now deleted), and captured by a reddit forum. The University of Toronto notified the university community of the threat via email on September 10, 2015. This response has been criticizedfor its lack of specificity. On September 11, 2015, the Toronto Police announced that the threats were not credible. The investigation is ongoing. 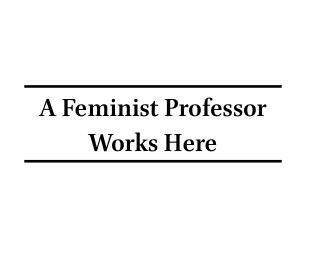 Do my feminist friends and colleagues at the U of T feel better about going to work now? Does a discredited threat neutralize the bad affects of the threat itself? I’ve been thinking about these questions and about the shadows that fell on my first September as a professor way back in 2004. It was my first real job and I felt enormously lucky and privileged to have it. I still do. One of my courses was a large lecture course. There were about 150 students enrolled in it. To be honest, the whole thing was terrifying. I had all the usual fears about screwing up. As everyone who has ever been in front of a classroom will recognize, teaching, in the best of circumstances, is its own exercise in vulnerability. It was, after all, just me up there. But then the terror ramped up to a whole new level. I started receiving emails sent from an anonymous hotmail account. The writer identified himself as a student in my class. He told me that he knew where I lived, where I bought groceries, the route I took to get to campus. He said other things but I don’t remember them anymore. I think I tried to forget them. I only remember being scared. Suddenly, things that seemed awesome were actually awful: I lived alone; I rode my bike to work; I was starting a new job in a new city where I didn’t know really anyone; I had my phone hooked up (remember when we all had land lines?) and was fine with having my phone number (and thus my home address) published in the phone book; I had just moved into the cutest little house and had the security system dismantled because I didn’t want to feel like a prisoner in my own house; I went to the grocery store all the time. I took these emails to the chair of my department who told me to take them to campus security. We never talked about this issue again. I wonder now if I really seemed that brave to him? I must have because he certainly never followed up. And I didn’t want to be the new girl making trouble and not getting along in her new courses. I left knowing that they could not help me. I called the phone company and told them that I no longer wanted my number to be public. I was mad that I would have to pay $4.95 a month for that privilege. I considered doing other things, but they felt futile and silly. And that was a big problem. I felt dumb for even feeling scared. The whole thing felt weirdly embarrassing. I’m pretty sure that, aside from the department chair and campus security, I didn’t talk about these emails with anyone else. The worst part was walking into that lecture hall twice a week, looking out at the sea of faces, and knowing that someone out there was going to leave class and send me another abhorrent email. It was just me up there. I would like to say that there was some kind of lightening clear resolution. But there wasn’t. I kept showing up. I kept trying not to be scared. One day, the emails stopped. But it took me a long time to stop feeling vulnerable. I still do sometimes. A lot of the time. Over the years, things like this still happen once in a while. I used to keep it all in a file somewhere and then I stopped because it felt like weight that I no longer wanted to carry. And I’m sure I am not alone in this. The problem with threats is that they remain threatening long after other people tell us that we don’t have to be scared. They cast a long shadow. They leave us feeling vulnerable long after they have been declared to be nothing more than shadows. So, what do we do with these vulnerabilities? We keep showing up. We find solidarities. We remember that it is okay to not be okay. I don’t want to feel vulnerable. But, as Wendy Chun reminds us, “we’re most vulnerable because we think we’re safe.” Chun refers to how the internet can become a series of gated communities where portals enclose us in seemingly private spaces. As Chun noted in her ACCUTE keynote address this past May, we shouldn’t conflateprivacy with security. I have no desire to live in a home where the window screens are outfitted with trip wires, and where the house keys are attached to a “panic button” that I am encouraged to keep next to the bed. That is also not how I want to live on-line, and not how I want to feel on campus. I don’t want to feel vulnerable, but I also don’t want to be locked down against students, against the possibilities that feminist hurt allows. I’m not kidding myself. This is not a good place. Wouldn’t it be nice if it were not the case that the histories that bring us to feminism are often histories that leave us fragile? But it is the place where we are and we are going to make something good out of these vulnerabilities. It is okay and not okay. Would just like to add to this important post that graduate students have been at the forefront of organizing a response to these threats, and that the CUPE 3902 Women's Caucus is having a solidarity demonstration today at 1 pm (https://www.facebook.com/events/760673750725707/). Folks unable to attend can wear purple to show their support for all women-identifying people and feminists of all genders at U of T.
Thanks for writing. I recognize the feelings – all of them. Sending strength…. Miriam, thanks for the reminder about the CUPE 3902 rally. I'll be there in spirit. It seems like a lot of us have gone through this… thanks for all your strength. Dear Lily, I have had similar things happen — anonymous emails, mostly of the vaguely threatening rather than creepy stalking variety, and I once had to have a student forcibly removed from my office. Like you, in all cases, I tried to notify some people but was pooh-poohed, like it was a real bother and that what I was saying would “have a negative impact on the students involved.” It's amazing how I left that experience feeling bad about myself. And it's amazing, too, as you note, that I've kind of forgotten a lot of the details, not because they don't matter or weren't scary, but because it's too common and too ignored. I have promised myself: anyone comes to me with this information, I act on it. That is what feminist administrators do. Oh Aimee, thank you for sharing. I cannot believe how many stories there are that are exactly like this. Thanks, Lily. And I didn't mean to ignore the substance of your post; as a graduate course instructor at U of T, I'm still working through my own feelings on this, and am grateful for your words here.